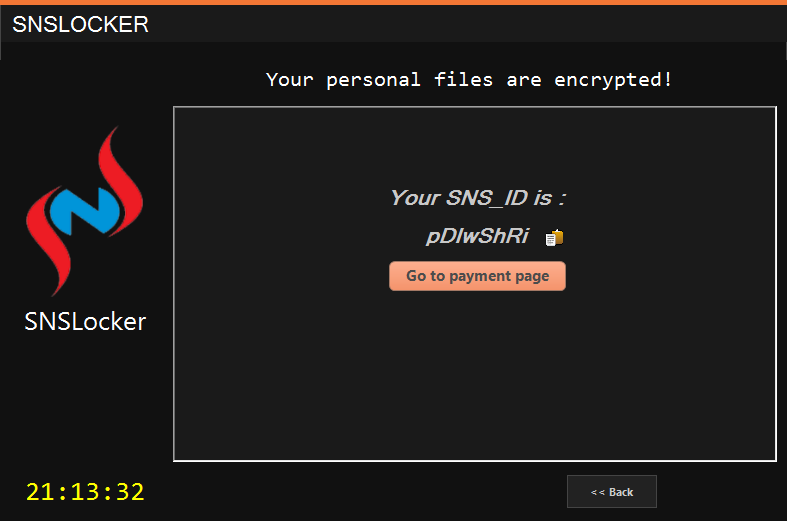 Malware researchers have discovered a new ransomware, calling itself SNS Locker. The new enciphering malware encrypts files with .RSNSLocked file extension and uses a strong AES-256 encryption algorithm to encode a wide variety of files on the compromised computer. The ransomware then changes the wallpaper of the user with a random scary pic, notifying him to pay money to get his files back. 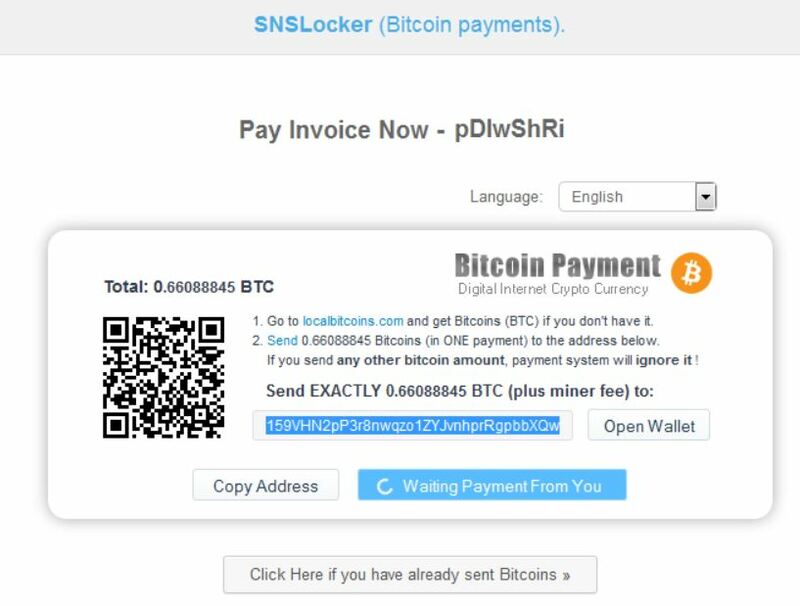 The ransomware asks for 0.66 bitcoins which are approximately 300$. 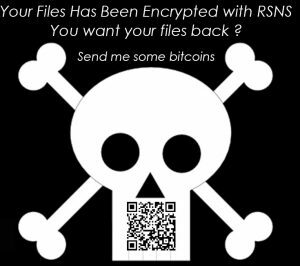 Short Description The ransomware encrypts files with the RSA algorithm and AES cipher and asks a ransom for decryption. Symptoms Files are encrypted and become inaccessible. A ransom note with instructions for paying the ransom shows as Wallpaper and a notification window. User Experience Join our forum to Discuss SNS Locker. It may be spread out via game cracks, other keygens, activators, malicious email messages sent out as spam and even by malicious links that have come up as a result of an adware causing redirects to them, such as DNS Unlocker, for example. AES cipher to encrypt the files on the compromised computer. RSA algorithm to encode the public AES key which is being sent to the criminals’ IP address. You fund the cyber-crooks to infect even more computers. You may not get your files back 100%. To remove this ransomware effectively from your computer, we advise following the Manual or Automatic removal steps below. Experts also advise downloading a reputable anti-malware program which will automatically take care of the SNS Locker files for you. Regarding file restoration, be advised that we have prepared some alternative methods in step “3” below that you may try while we investigate any decrypters which are publicly released and working. As soon as there is a solution, expect an update on this article’s web page. Threats such as SNS Locker may be persistent. They tend to re-appear if not fully deleted. A malware removal tool like Combo Cleaner will help you to remove malicious programs, saving you the time and the struggle of tracking down numerous malicious files. Threats such as SNS Locker may be persistent on your system. They tend to re-appear if not fully deleted. A malware removal tool like SpyHunter will help you to remove malicious programs, saving you the time and the struggle of tracking down numerous malicious files. Note! Your computer system may be affected by SNS Locker and other threats. SpyHunter is a powerful malware removal tool designed to help users with in-depth system security analysis, detection and removal of threats such as SNS Locker. 1. Install SpyHunter to scan for SNS Locker and remove them. 2. Scan with SpyHunter, Detect and Remove SNS Locker. 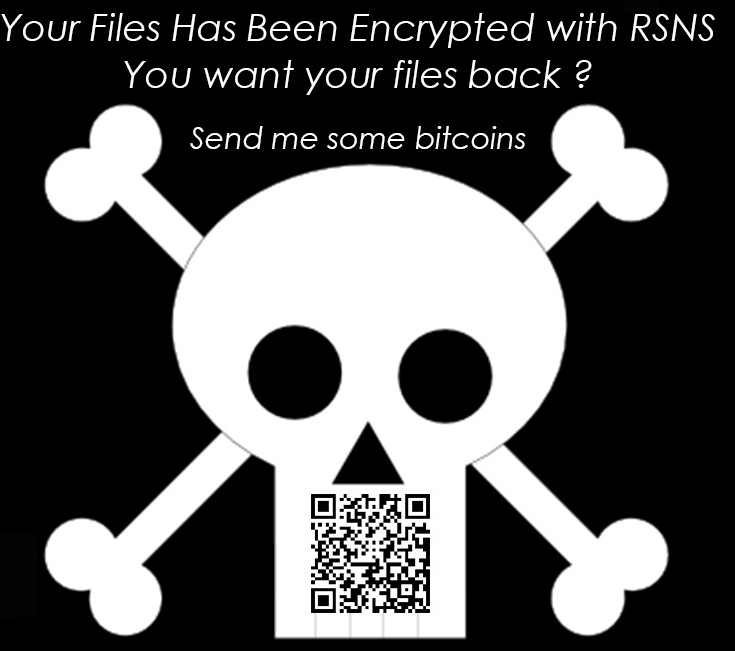 Ransomware infections and SNS Locker aim to encrypt your files using an encryption algorithm which may be very difficult to decrypt. This is why we have suggested several alternative methods that may help you go around direct decryption and try to restore your files. Bear in mind that these methods may not be 100% effective but may also help you a little or a lot in different situations. Note! Your computer system may be affected by SNS Locker or other threats. Remove SNS Locker by cleaning your Browser and Registry. Fix registry entries created by SNS Locker on your PC. Combo Cleaner is a powerful malware removal tool designed to help users with in-depth system security analysis, detection and removal of threats such as SNS Locker. Step 5: In the Applications menu, look for any suspicious app or an app with a name, similar or identical to SNS Locker. If you find it, right-click on the app and select “Move to Trash”. Step 6: Select Accounts, after which click on the Login Items preference. Your Mac will then show you a list of items that start automatically when you log in. Look for any suspicious apps identical or similar to SNS Locker. Check the app you want to stop from running automatically and then select on the Minus (“–“) icon to hide it. Remove SNS Locker – related extensions from your Mac’s browsers. A pop-up window will appear asking for confirmation to uninstall the extension. Select ‘Uninstall’ again, and the SNS Locker will be removed. When you are facing problems on your Mac as a result of unwanted scripts and programs such as SNS Locker, the recommended way of eliminating the threat is by using an anti-malware program. Combo Cleaner offers advanced security features along with other modules that will improve your Mac’s security and protect it in the future. Hey !, I found this information for you: "Remove SNS Locker and Restore .RSNSLocked AES-256 Files". Here is the website link: https://sensorstechforum.com/remove-sns-locker-restore-rsnslocked-aes-256-files/. Thank you.